There’s nothing worse than not being able to sleep: The dreaded tossing and turning as you slowly watch the clock advance into the early morning hours. However, as tempting as taking a sleeping pill might be, it’s best to avoid them. Highly addictive, sleeping medication can become ineffective as immunity is built. 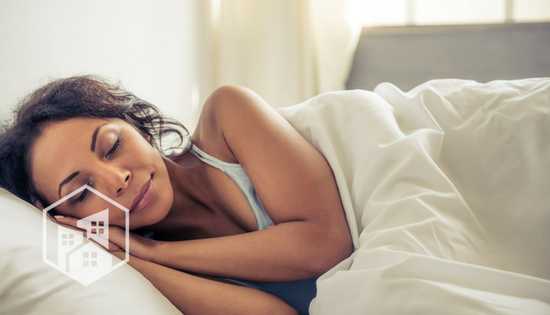 While it might seem like a quick fix for severe insomnia, both over-the-counter and prescription sleep aids contain ingredients that inhibit your body’s ability to produce melatonin, which can make sleeplessness worse. In lieu of medication, try some of the natural remedies outlined below. Your sleeping environment has a significant impact on your rest. If you’re having trouble falling – and staying – asleep, it could have something to do with your bedroom. If it’s in disarray, you could be bringing unnecessary stress into the room, causing your subconscious to go haywire and keep you from getting the precious Z’s you need. Transform your bedroom into a relaxing haven: clear away clutter and any work-related items, decorate with soft lighting or candles and remove electronics. For an added benefit, diffuse lavender essential oil into the air an hour before bedtime. • Warm milk, honey and nutmeg. If you’re not a dairy drinker, feel free to substitute the nut milk of your choice and heat to a comfortable temperature. Stir in a tablespoon of honey which contains L-tryptophan – an essential amino acid that helps regulate sleep-wake cycles. Finally, add a sprinkle of ground nutmeg. This potent spice contains components similar to tranquilizers, so only use a dash or two. • Herbal tea. Not only is the warmth of tea comforting and able to induce feelings of sleepiness, it can also have excellent calming benefits – especially if it contains lavender, chamomile or valerian. These herbs are natural sleep aids and can leave you feeling drowsy within an hour after sipping. Make sure you double-check that your tea of choice is caffeine-free, as caffeine can severely disrupt rest. • Tart cherry juice. Cherries are one of the few foods that naturally contain melatonin, and according to a study conducted by Louisiana State University, the fruity nectar can afford drinkers with an average of 90 additional minutes of sleep. If you want to boost its effectiveness, add a drop or two of natural vanilla extract. The presence of light – even in the slightest amount – can inhibit the production of melatonin, depending on how light or heavy of a sleeper you are. If there’s a streetlight outside your window or light streaming in under your bedroom door and keeping you from getting peaceful rest, consider wearing an eye mask to keep things dark and help you get quality rest. If constant thoughts keep you up as soon as your head hits the pillow, try meditating before bed to ease your mind. Meditation is a discipline that takes consistent practice and a few weeks to become effective. However, if you stick with it, meditation can help you sleep easier and give you more energy during waking hours. Start with 5 or 10 minutes of meditation before bed, and build up to 30 minutes or even an hour. To guide your meditation process and keep yourself accountable, download a meditation app. Two of the best on the market today? Headspace and Calm. When it’s getting close to bedtime, put your phone away and turn off the TV. LED-backlit screens on almost all digital devices halt melatonin production, which can make it difficult to fall and stay asleep. Instead of entertaining yourself with activities that require screens, read a book, write a letter or meditate to wind down. And whatever you do, never stare at your phone or tablet in a completely dark room – the intense “blue light” emitted from these devices can cause macular degeneration or even blindness over prolonged periods. We’ve all heard it’s not great to eat a few hours before bedtime, but that’s not always true. While you should avoid gorging on pizza or eating a large meal before turning in, having a small – and healthy – snack is harmless, especially if your stomach is growling. But what are some of the best pre-bed snacks? The National Sleep Foundation recommends noshing on foods that naturally contain melatonin, such as cherries, a small slice of turkey or a cereal containing complex carbohydrates, such as quinoa and barley.